Barfi is a condensed milk based sweet confectionery with its origin in India. The name is a derivative of the Persian word ‘barf’, which denotes snow. 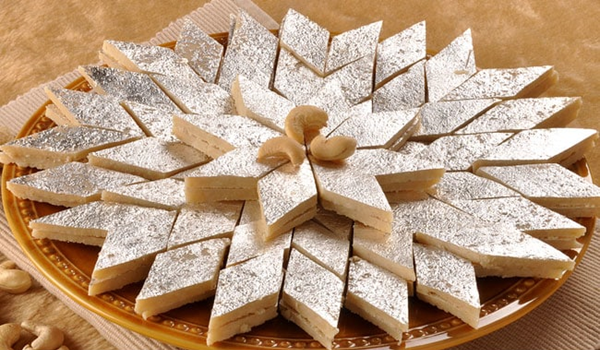 A few of the famous kinds of barfi include gram flour barfi , cashew nut barfi, pistachio barfi and peanut barfi. The main constituents of barfi include condensed milk and sugar. The ingredients are cooked in a vessel until the mixture stiffens. The flavour of a barfi is often amplified with fruit flavourings such as mango or coconut or nuts such as cashew, pistachio or peanut and spices such as cardamom or rose water. Barfis are usually coated with a thin layer of edible metallic leaf particularly a silver coating. They are typically cut into square, diamond, or round shapes. Different types of Barfi vary in their colour and texture. The most popular spice used to flavour this dessert is cardamom. However, depending on where it is prepared, many different flavourings are added to this simple but popular dessert. For added flavour and to provide a colourful contrast, often it is rolled in crushed nuts before it is served. The confection is served in India, all year round, but especially consumed during the holiday seasons, wedding ceremonies, and the religious festivals. Barfi is often served at various festivities across India. 1. Take a large bowl and add milk powder in it along with condensed milk. Make a stiff dough using these ingredients. Once done, keep the dough in freezer and freeze it for at least 20 minutes. 2. Take the dough and grate it in a bowl. Keep this grated dough aside for further usage. Take a deep bottomed pan, keep it on low flame and heat ghee in it. 3. Add the grated dough to this pan with water. Mix well and stir in cardamom powder in the pan, cook this mixture until the water dries out and the mixture accumulates in the pan. 4. Pour this prepared mixture in a pan and add pistachios to it. Let the mixture cool and cut the barfi into desired shapes. 5. Garnish it with silver coating and almonds and serve!